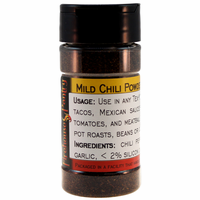 Product Details: Use this mild chile powder in a variety of dishes, especially Indian, Mexican, and Tex-Mex foods. Add flavor and color to meat rubs, tacos, stews, barbecue sauces, tomato dishes, and meatballs. Sprinkle onto baked fish, grilled chicken, and cottage cheese. Ingredients: chili pepper, spices, salt, garlic, less than 100 PPM silicon dioxide and ethoxyquin. Packaged in a facility that also handles wheat, milk, soy, egg, sesame, peanuts, and tree nuts. Nutrition Facts: Click here for data per 1 Tbls. (7.5g) serving. Click here for data per 100 grams. Shelf Life: 3+ Years when stored at room temperature or below in an air-tight container out of direct light. 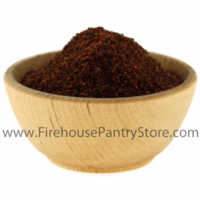 We use this to make our: Firehouse Taco Seasoning, Firehouse Taco Dip Mix, Create-Your-Own Tex-Mex Dip Mixes, Create-Your-Own Salsa Mixes.